Emil Praslick III – Head coach of the U.S. Palma team and retired head coach of the U.S. Army Marksmanship Unit. Emil will discuss tactics, strategy, and mindset for successful wind-reading. Eric Stecker – Master Bulletsmith and President of Berger Bullets. Eric will be presenting on precision bullet making technology. Nick Vitalbo – Owner of nVisti Tactical Innovations and chief engineer for Applied Ballistics. Nick will discuss the state of the art in laser rangefinders and wind reading devices. Mitch Fitzpatrick – Applied Ballistics intern and owner of Lethal Precision Arms. Mitch specializes in Extended Long Range (ELR) cartridge selection and rifle design. Trajectory Basics – zeroing, point blank range, danger space, incline shooting. Wind – Mechanism of wind deflection, reading the wind, wind strategies, wind sensing gear. Secondary Effects – Spin drift, Coriolis, aerodynamic jump. Bullet Drag Modeling/Ballistic Coefficient – Definitions, testing, use. Bullet Stability – Basic gyroscopic stability, transonic stability, limit cycle yaw. Ballistic Solvers – How they work, best practices, demos. Weapon Employment Zone (WEZ) Analysis – How to determine and improve hit percentage. Optics and Laser Technology – State of the Art. The seminars costs $500.00. 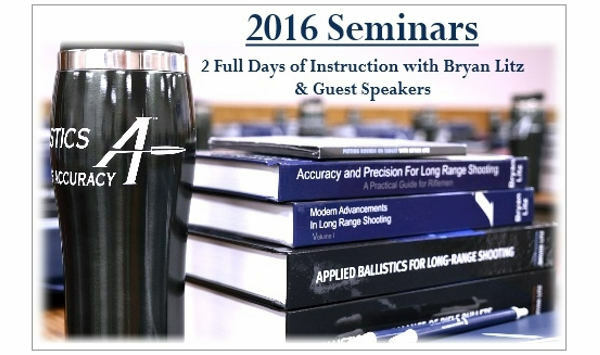 But consider this — each seminar participant will receive the entire library of Applied Ballistics books and DVDs, valued at $234.75, PLUS a free copy of Applied Ballistics Analytics software, valued at $200.00. So you will be getting nearly $435.00 worth of books, DVDs, and software. In addition, a DVD of the seminar will be mailed to each attendee after the seminar concludes. Bryan Litz explains: “Subjects will be introduced from an academic-first, principles perspective. Once the scientific basis for the material is established, the ideas are further demonstrated with examples from instrumented live fire. We explain the science, and then present examples of the principles in action. You’ll leave with an understanding of the subject matter, as well as a knowledge of how to apply it in the real world.” To learn more about the Ballistics Seminar, read this AccurateShooter Forum Thread. Full library of Applied Ballistics Books and DVD set, valued at $234.75. Free copy of Applied Ballistics Analytics software, valued at $200.00. Binder including: hand-outs, articles and various assorted utility worksheets. Fall 2016 : Nov. 3 – 4, 2016 – Caraway Conference Center, 4756 Caraway Mountain Road Sophia, NC 27350 Phone: (336) 629-2374. 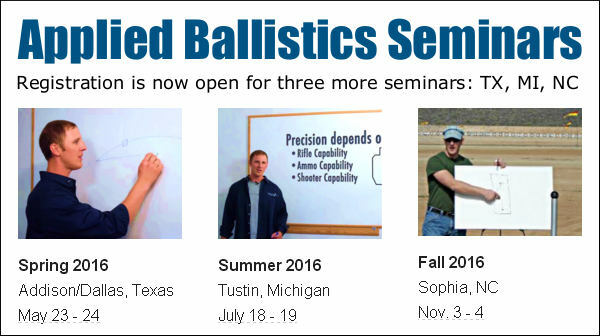 Share the post "Applied Ballistics Will Offer Three More 2016 Seminars"